I had my first quiche in the 1970s, when a couple hippies opened a French-style Breakfast/Brunch restaurant, “Crêpe Faire,” in Portland OR. Now that I think back to those old days, I realize that my 20s were a decade of food discovery for me, as growing up in rural Montana did not provide much beyond ‘steak and potatoes’ cuisine. Quiche is one of those wonderful items you can make with whatever you have in your fridge and create as you go. All you really need are eggs, milk/cream, and cheese, then add your choice of veggies and/or meat or seafood. And of course, a crust. Traditionally, quiche is made with a French Quiche Crust which includes egg yolk. But you can use any type of crust (although I do not recommend a sweet crust), or go Greek with a phyllo crust as highlighted in this recipe (see my Tomato Phyllo Pie recipe for more about this). This recipe is adapted from one by Susan Selasky in our local newspaper, the Daily InterLake (originally published in the Detroit Free Press (1)). This recipe adds a small amount of flour to the egg mix, but I don’t usually do that, as I like the custard to be more creamy in a quiche. So I include it as an optional ingredient. 9″ or 10″ deep-dish pie pan; a quiche pan could be used but you will need less ingredients or a larger quiche pan, as it is much shallower than a deep-dish pan. Prep: Grate cheese and set aside in a bowl. 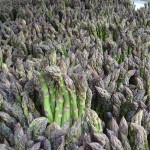 Wash and trim asparagus, retaining the tips;. Cut 8 spears about 3″ long; trim remaining tender part of stems and remaining spears into 1″ lengths. Alternately, cut all spears at 4″ long (for 9″ pan), or 4 ½” long (for 10″ pan), then cut remaining tender part of stems into 1″ lengths. Set aside. Wash and drain spinach leaves. Sprinkle lightly with salt, then tear leaves. Place in hot, dry cast iron pan and toss until moisture evaporates. Remove wilted spinach to colander and squeeze to remove remaining moisture. Set aside (in the colander). Phyllo Crust (NOTE: if using a different crust, follow instructions for a partial pre-bake of the crust). Preheat oven to 350°F. Thaw the phyllo dough, carefully remove 8 sheets and transfer to your clean work surface; keep covered with a damp cotton cloth or paper towel. Roll up remaining phyllo and refreeze for future use. Melt butter and keep warm until ready to use. Working with one sheet of phyllo at a time, brush it lightly with melted butter – as in streaks. Transfer buttered sheet to pie pan, placing it in the center so that at least 1″ hangs over the edge, but if the sheet is only 9″ wide, it will not drape over the edge all around. Brush another sheet and place it in center of pan, but rotated a few inches from first sheet. Continue brushing and layering the sheets, each time rotated a few inches from previous sheet, until all edges of the pie pan are covered and phyllo hangs over the edge all around. Fold overhang over to form an edge, and brush with butter. Bake in preheated oven 6 – 8 minutes. Filling: Heat olive oil in skillet. Add asparagus pieces (not the trimmed spears) and sauté 3 – 5 minutes. Add spinach and toss, seasoning with salt and pepper to taste. Remove partially-baked phyllo crust from oven. Place asparagus/spinach mixture over bottom of crust. Sprinkle with grated cheese, reserving a small amount. Whisk the eggs; add milk, cream, flour (if using) and herbs, and whisk again, then pour over the veggies. NOTE: you can also add the cheese to the milk/egg mixture, but I prefer to sprinkle it separately over the veggies as in previous step. Arrange tomato slices in center. Arrange the asparagus spears like spokes of a wheel on top, and sprinkle tomatoes with reserved grated cheese. Return to oven and bake 30 – 35 minutes, or until filling is set and slightly puffy. If edges begin to brown too quickly, cover them loosely with foil. When filling is set, remove from oven and let rest 10 minutes before slicing and serving. This entry was posted in Baked, Dairy, Eggs, Fat or oil, Flour, Grain, Herbs, Leafy Veggie, Pastry, Vine veggies and tagged asparagus, cheese, cream, eggs, herbes de provence, italian herbs, milk, phyllo, spinach, tomato. Bookmark the permalink.